No golf bucket list is without an Irish getaway. The culture, history and beauty of Ireland makes it a go-to destination for any traveler, and for a golf fan there are few places that offer more dream courses. But you don't have to only play golf or just be a sight-seeing tourist when visiting Ireland. You can do both — Ireland's long summer days come in handy — and it's quite easy. You just need a little time to plan. That's where we come in. So without further ado, here is our what-to-see, where-to-play, where-to-eat and where-to-stay manifesto for Ireland. But be warned, our itinerary is not for the unambitious. Camera and golf clubs required. Grab a Sunday night redeye from NYC or your airport of choice and fly into Dublin early Monday morning and snag your rental car. (Be careful driving on the other side of the road, you Americans!) From there head downtown and into the heart of the city, where you will find more than enough to occupy your day. There's plenty of famous pubs — The Brazen Head and The Temple Bar, among others — and other go-to stops like the Jameson Distillery and the Guinness Storehouse. After some sightseeing, hop back into the car and check into the Portmarnock Hotel and Golf Links just outside of the city. Try to get a room that faces east and overlooks the Irish Sea or one that faces south over the golf course. If you plan it right, you will have just enough time for an evening nine holes (or maybe 18) at the hotel's Bernhard Langer-designed links course. Depending on the time of year, you can play golf until as late as 10 p.m. in Ireland, so there's plenty to pack into one day. Head just three kilometers down the road from the hotel and play historic Portmarnock Golf Club, which has hosted Irish Opens, Walker Cups and some of the best golfers to ever live (Sam Snead, Arnold Palmer, Phil Mickelson, etc.). It's ranked 49th on GOLF's 2017-18 Top 100 Courses in the World list, and it doesn't disappoint (the blue and red nines are the championship holes, and there is also a yellow nine). Different tees make it playable for all handicaps, and it provides a fun and fair test. Trouble is waiting if you miss the greens, but the holes flow together seamlessly, and the scenery helps provide an unforgettable experience. The par-3 15th runs parallel with the coast and is as memorable as they come. After finishing up at Portmarnock, head south a couple of hours to Faithlegg House Hotel and Golf Resort in Waterford to kick off the second leg of your trip (or make a small detour and play the European Club, ranked 97th in the world). Here you can check off the southeast coast from your to-do list and get some much-needed R&R while you are at it (after all, that's what vacations are for). Faithlegg offers a relaxing getaway that's a nice change from the hustle and bustle of Dublin. It's a gorgeous building (you weave through the golf course to get to it) and hosts several banquets and weddings. It has all the amenities you need and then some. There's a relaxing pool, fitness center and even kid-friendly options, like the massive play area out back. The food is superb, too, and you have a couple of different dining rooms and menus to choose from. Make sure to get a quick 18 holes in on the resort course that evening or play in the morning before you get back on the road. The greens are tricky on this parkland layout. On your way out of town, cruise by Waterford Castle — another option for lodging and golf — which is in the city of Waterford and nestled on an island. Head west, and bring your camera, phone, GoPro or whatever photo-taking device you use—it's castle day. En route to your next destination, Killarney, take pit stops at the Rock of Cashel, Cahir Castle and Blarney Castle. They are not too far out of the way and worth the admission if historic structures are your thing. They are some of the best in the country. Short on time? Then just hit one of them. Want less castles and more city? Then spend some time in downtown Cork. Want less city and castles and more golf? Then continue west and try to get a tee time at Old Head, which is located in one of the most breathtaking areas you will ever find a golf course. End your night by checking into The Malton in Killarney, which is a gorgeous and historic hotel centrally located in the city. It first opened in 1854 (under a different name) and still shows off its Victorian features. Beautiful photographs plaster the walls, crown molding lines every inch and the rooms are a luxurious retreat welcomed by any vacationer (and the bathrooms are as big as NYC apartments). There's a plethora of dining options there as well, but a slew of restaurants are a short walk away. You can't go wrong. Killarney is located in the county of Kerry, and it's the perfect start and end point for the famed Ring of Kerry trip, which is a breathtaking drive around the Iveragh Peninsula on the southwest part of Ireland. You can either drive your own car or buy a ticket for a bus tour, but if you take your own car you can pick your own stops (just be careful braving those curvy, narrow roads). The loop is about 112 miles, but that doesn't take into account the times you stop to check out the historic sites, beautiful views or quaint, sleepy towns welcoming the tourists. Want to make the Ring truly unforgettable? Then split your day in half and take a break for 18 holes. One fantastic option, Waterville Golf Links — GOLF's 82nd-best course in the world — is just a few minutes off the route of the Ring. After completing the Ring of Kerry (and/or your round) head out on the town to enjoy some Irish food and music before retreating back to your hotel and resting up. Pack your bags and leave Killarney, but you won't be in the car long. Just an hour north is Ballybunion, and GOLF ranks its Old course as the 17th-best in the world. From there it's less than two hours to Ennis, your next stop (if you skip the golf, then Killarny to Ennis is just under two hours). Ennis has lots of great restaurants, live music and a wonderful small-town feel. Check into the Temple Gate Hotel and get settled, then jump back in your car and drive 30 minutes west to the Cliffs of Moher, which is considered by many the top tourist destination in all of Ireland. At the Cliffs you can spend anywhere from an hour to three, as the walking paths and views never really end. It's miles and miles of rock, ocean and amazing natural landscape. From 400 feet above the Atlantic Ocean, the views are unlike anything you have ever seen. Back at the Temple Gate, enjoy a location that puts you right in the heart of the city. Through the backdoor of the hotel you are just steps away from the narrow streets that are flooded with bakeries, quaint coffee shops, mom-and-pop stores and more dining and live music options than you could ever want. Back at the hotel, there are two more restaurant options, one with a fancier flair and another, the Preachers Pub, that has live music and provides a feel that's both Irish and woodsy. Make sure to get a Guinness. It's time to head home, but not after one last bucket list round of golf. Not far from Ennis are two spectacular options in Lahinch (30 minutes away) and Trump International Golf Links & Hotel in Doonbeg (45 minutes). 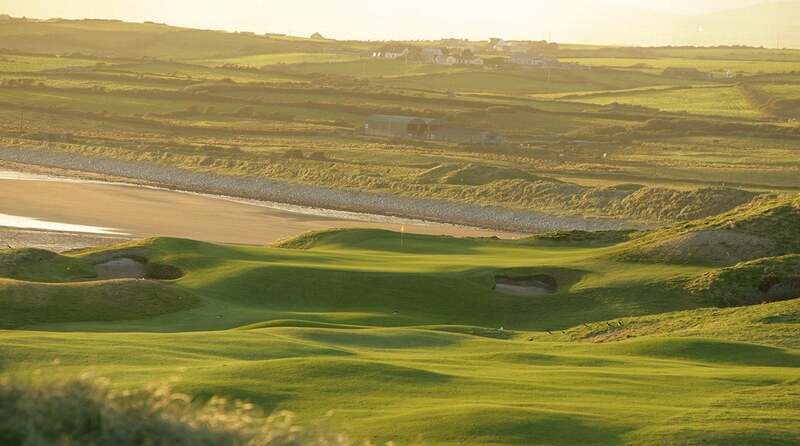 Lahinch's Old course is ranked 35th on GOLF's Top 100 Courses in the World list. It was first designed by Old Tom Morris and later redesigned by Alister MacKenzie of Augusta National Golf Club fame. Talk about a sweet way to end a trip. Both Trump International and Lahinch are an hour drive from Shannon Airport, where you can catch your ride home. Shannon is small enough so it won't be overwhelmingly busy yet big enough where you can catch direct flights back to where you need to go. And, with the time change, you can take an afternoon flight and get back in time for dinner (or close enough). Last but not least, use Sunday to recuperate before heading back to work on Monday. Hey, you earned it.